1 - 4) Widescreen, widespread, destruction! 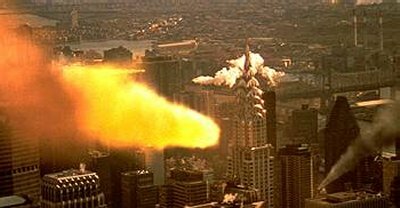 5) What DIDN'T we see get destroyed by a tornado in L.A, in "The Day After Tomorrow"? 9) In which classic 70's sci-fi movie do we see an ivy-covered Abe Lincoln memorial, in an abandoned Washington? 6) In the 50's sci-fi classic "When Worlds Collide", how long did humanity have to prepare itself for obliteration from an oncoming planet? 10) What kind of creature told "Donnie Darko" that the world was going to end in just over four weeks, in the 2001 cult favorite? 7) What was the common name of the virus that spelled a zombie-riffic doom for our world in "28 Days Later"? 11) In the 1980's cult classic "Night of the Comet"- why did the survivors avoid being turned to red dust by the comet? 8) What metal was the hull of the ship that drilled to the center of the Earth in "The Core" made out of? 12) Why did "The Birds" in the Alfred Hitchcock classic seem to have it in for mankind?